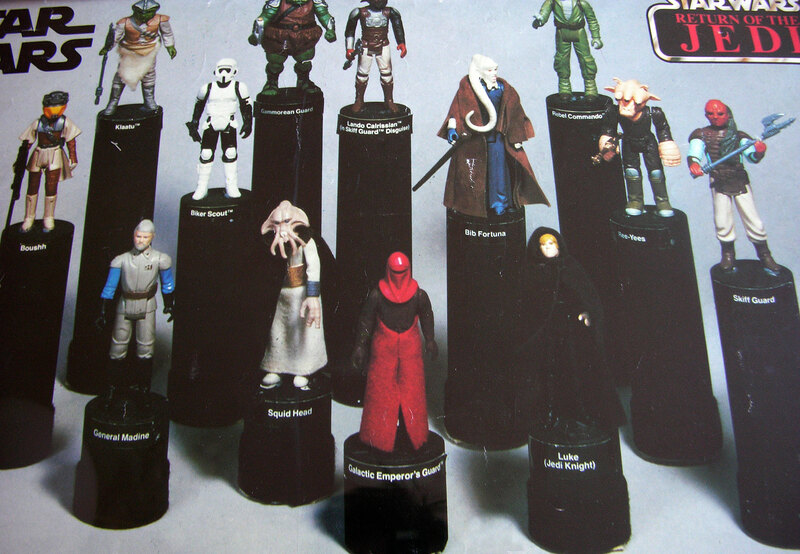 Hi there, more than a year ago we had a discussion about the "Luke in Robes" and "WOOF" action figures as they appear in the 1983 Meccano retailer catalog ( click here ). 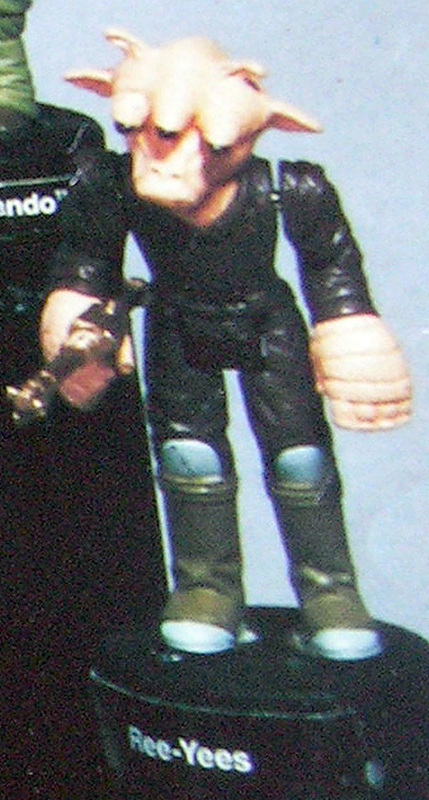 We learned in the thread (that one or another) that WOOF was actually the original / early name given to the KLAATU character, explaining that Kenner used that name early in the process of designing the ROTJ figures. I just wanted to share that I've been to the SW exhibition that takes place in Belgium and I've noticed that WOOF was actually hand written onto the Klaatu mask props displayed at the event. As shown in the pictures, it also bears the name of "Dan Mater". Wow, that is awesome. It is amazing that we are still finding new things. However, now we have a real important question. Is it Woof or Wooof??? 2 Os or 3. How did Kenner get it wrong? Did they get it wrong? Also, how does Klaatu look like a dog? Now in its 8th Season and 6th Year WAMPA WAMPA!!! That prop looks amazing, such great detail. Something almost Kraken like about him. Wooof or Woof does seem an unusual name as he looks more like a lizard than a dog. The name Klaatu (as do Barada and Nikto) comes from the name of character (and line) in the film The Day The Earth Stood Still. There's a remake of that film due out this year too which should be worth a watch. Looking to acquire vintage hardcopy parts. As mentioned in one of the earlier threads there is a HC that says "wooof". 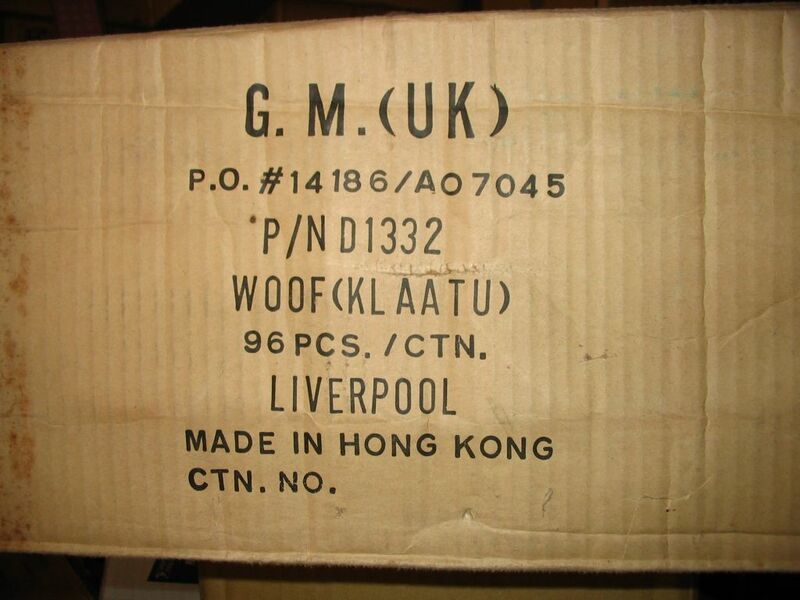 However, the Palitoy shipping case is marked Woof. I've also seen some sculpting height paperwork from 3/23/82 and it's marked Woof. There's also a Micro Figure Height possibilities list from 7/27/82 where he is mentioned as Wooof. Finally, there's a figure weapon production schedule (8/6/82) and another info sheet for character accessories (also marked 8/6/82) where he is just noted as W.F. LOL In short, Kenner was all over the place. My best guess is Woof and Kenner just butchered it in some places. southside_201 at yahoo dot com My PMs are full so please don't use. I may be dreaming it, but I want to say I've seen a preproduction sketch that spelled it with three O's. If anyone can locate that (try the Art of ROTJ or similar references), I'd say go with the artist's own spelling. It would be only natural for folks who heard it spoken to assume it was the regular onomatopoeic spelling, and hand-write it on a costume piece, or whatever. By the way, that costume head fully reads "Dan Mater, Woof 2, Brian Lee, Woof 3". Does this mean the same mask was worn by two extras/stuntmen at different times? The three O spelling would be my preference anyway. Woof isn't a very Star Wars-y name. But somehow Wooof is. "Hi, I'm Alex from Imperial Insurance." "Hey... don't you work for the Endor Express?" "I'm a man of many talents." Would that be a first shot pictured in the above picture? I plan to live forever, so far so good! That's great Stephane...so cool to see a visual connection from the film's production to what's written regarding the character's name in the Archive entry that John linked to. This thread got me thinking about a past hobby of mine. As an early teenager I collected Decipher's Star Wars Customizable Card Game sets, and I always thought that "Wooof" was a hilarious nickname for a guy I always knew as good old "Klaatu"...particulary due to the third "o." Whether or not Kenner made a mistake with the name or if it was bestowed upon him by the original artist, I just find it funny that the extra "o" made it onto a more recently produced and licensed collectible card. Great names never die. Thanks for the update and the referrals to the older threads...I still have so much to learn and catch up on. Great discovery Stephane. I just check my tri-logo poster (the one with the B-Wings and exploding Stardestroyer). On that poster the label for Klaatu is "Klaatu", but the label for "Weequay" is just "Skiff Guard". I have read somewhere (don't remember where) that the palace figure of Klaatu is the character Klaatu, and the skiff guard figure is the character Wooof. There is no shadow of doubt, that it's two different characters, as you see both of them die in the movie. Don't know why Kenner named both of them Klaatu. They're either all, or almost all, painted hardcopies. Several are in collections. Ron has the Ree-Yee, I think Rasmus used to have the Boushh, and a few others just look like obvious HCs. Wonder which more figures that have survived until today?